Fourty-four attacks by pro-Russian militants were registered. Three Ukrainian servicemen were wounded amid 44 attacks by the Russian occupying troops during the first day of the Joint Forces Operation (JFO) in Donbas, the JFO press centre has said on Facebook. "Ignoring international agreements, the enemy six times opened fire with 120-mm and 82-mm mortars and small arms. Three servicemen were wounded. They received professional medical help and were evacuated to hospital. Their lives are not at risk," the JFO press centre said in its morning update. 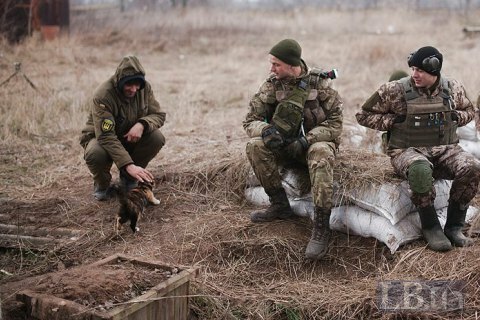 The JFO troops at front positions returned fired in line with the Minsk agreements. "Last night was relatively quiet. The enemy shot at our positions five times. According to our intelligence, the enemy sustained losses, there were five wounded," the press centre said. The Defence Ministry's spokesman, Maksym Prauta, said at a briefing that four servicemen were wounded. "Four our defenders were wounded as a result of enemy fire. Three victims are in satisfactory condition. One serviceman is in medium-gravity condition," he said. On 30 April, President Petro Poroshenko announced the completion of the antiterrorist operation and the start of the Joint Forces Operation.